Since its first arrival on the scenes in 2002, Kodi (initially XBMC) software has gone through many iterations. This has been done to meet the changing demands of the consumers at large, born after continuous developments in the technological sphere. Every new release brought in some very powerful features and made one of the most in-demand streaming software service, a must-have. We’re now in 2019. Hence, a compilation of the Best Kodi Boxes in 2019 makes every sense, to keep up with what’s “technologically cool” today. But we’ll not go into the listicle just yet. Even though Kodi is a household term today, there still might be a lot of people, looking to get their hands on it, for the very first time. In such cases, it becomes customary to make them aware of the ins and outs of the Kodi software and the hardware boxes available for them. We’ll try to keep it short but if you’re already a pro at this, you might want to skip directly to the point from where the compilation starts. Now, you must have been coming across this same very definition on almost every site that talks about Kodi software. But, if you were to believe us, there’s much more to Kodi and this one-liner can just not do justice, to what this incredible piece of software can actually offer you. Kodi, developed by XBMC foundation, is a media player that lets you play both streamed – sports, live TV, movies, as well as local (already stored on your hard drive/external drive) content. The streaming services are facilitated by the whole host of Kodi addons that you’ll have to first install (a completely hassle-free process), only upon which, you can stream your favorite movies/shows. The software is currently available on almost all the prominent operating systems – Mac OS X, iOS, Windows, Linux, Android and even Raspberry Pi devices. Kodi is capable of sourcing content from many different avenues and being open-source means that the software is freely available to just about anyone. With this, all of your gadgets can form a part of your very own digital streaming hub, either across the internet or connected wirelessly in your home. The software’s versatility allows it to support the majority of the file formats, in case of both audio and video. The one thing that sets Kodi media player apart from its peers like Apple TV and Google Chromecast, is that it’s restricted by neither a curated app store nor by licensing agreements. This paves the way for Kodi users to download the majority of the community-built apps, which otherwise might not be available for download, per se the guidelines that govern the leading app stores of Apple and Google, among others. The only drawback here is that Kodi does not actually manufacture its own streaming boxes, which makes it a tedious task to search for your own streaming device, for the software to run on. This brings us to our original topic – Best Kodi Boxes (2019). We’ve come a long way, from the time when XBMP was transformed to Kodi in 2014, with respect to the choice of streaming devices on offer today. These streaming devices, called as Kodi boxes are nothing but small plastic boxed inexpensive gadgets that can run Kodi without a computer. It can also be called as a simple plug and play device, which you can plug into the HDMI port on your television and play. They mostly run Google’s Android operating system and can be customized to a great extent. But with the range of Kodi boxes that are available today, it’s not easy to find the best one, tailormade for your needs. They come in a huge variety of specifications, features, which sometimes can make up for a difficult task, to decide on the best one for you. And that’s the very reason you’re here. We’ve curated this list of four of the best Kodi boxes that are still on the very top of their trade, even in the new year. They were tested on a whole range of different criteria and the result is what you’re going to go through now. The 2nd generation of the Amazon Fire Stick – the Amazon Fire TV Stick with Alexa Voice Remote, has been creating waves, since the time of its launch approximately a year ago. Let’s talk a little bit about Amazon’s Alexa first. It might come off as a surprise to many, but in the world of home voice tech, Amazon’s Alexa is right there on the very top and the voice assistants of other biggies – Apple, Google, and Microsoft, are still trying to play a catch-up game. Although the retailing giant might have been utterly unsuccessful with its Fire phone, which made some noise in the early part of 2014, its voice assistant is here to stay and stay at the very pinnacle. Apart from its ground-breaking lines of home speakers (Echo & Dot), the company has now started building its talking digital assistant into other popular home devices. And the cheapest one in this category is the Fire TV Stick. Coming back to the Fire Stick now, it is the best visually friendly device, which is just one of its many benefits. 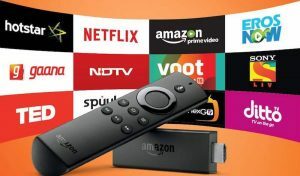 Dubbed as arguably the most powerful media streaming gadget that there is, Amazon claims this to be almost 30% faster than its 1st generation Amazon Fire TV, courtesy of an upgraded quad-core processor. The device comes pre-loaded with all the major entertainment avenues of today – YouTube, NBC, HBO, Hulu, Netflix, Sling, ESPN and of course Amazon Video. We tried to ascertain the company’s claims and came to a conclusion that a lot of these apps does actually open faster on the new stick. From the last year, Amazon has added Crunchyroll, PlayStation Vue, and Spotify, to enhance the overall experience. And then there is this Kodi that can be installed as well. The device supports resolutions of 720p and 1080p and at 60 frames per second (fps), it’s the best android box that you can get at that price. The fact that the device houses 15000+ games and applications, there’ll be something for just about everyone in your home. The remote control that Amazon offers with the Fire Stick is also very simple – the all-important voice input key, a D-pad for navigation (with a clickable “enter/confirm” button in the center) and precisely 6 buttons for playback control. Apart from the stick and the remote, the package also includes a short HDMI extender cable, a pair of AAA remote batteries, a micro USB Cable, and a USB power adapter. Basically, everything apart from the TV itself, that you’re gonna need to start streaming. To talk about some of the downsides of the device, which are anyway very few in number, the search results lean more towards Amazon’s in-house instant video libraries (whey they’re available). The current user interface has been designed in such a way that it pushes users a bit too aggressively towards Amazon’s own content (not applicable for Prime users). Secondly, a few of other prominent services with the likes of Google Play and Vudu are missing and the device’s absolute dependence on Wi-Fi for its functionality is also one of the other drawbacks. The biggest turn-off might be the fact that because it’s basically an Android device, Kodi needs to be installed manually as it does not come pre-installed with the device and before installing, you’ll first need to sideload it. This does not translate to a very big issue here and there are actually more than just a couple of options to manually install the software. Another not-so-big issue is that Amazon does not let you customize the various categories as per your will. This feature, however, is available in the Roku streaming devices. When both of Amazon’s extremely popular streaming devices are outlined in one place, it becomes a seemingly difficult task to zero down on one of the two. The reason could be that apart from the cost, they don’t actually differ much in terms of their offerings. Well, if you too have the same perception, there’s all the more reason that you need to continue reading. Since the launch of its 1st generation of flagship Fire TVs back in 2014, Amazon has made two iterations to its basic device – the 2nd generation Amazon Fire TV which came out in late 2015 and the 3rd generation, launched in September 2017. To start with, we’re not a bit hesitant to declare now only that if you are a 4K lover and want to watch all of your content in 4K only, you can just stop right here and go for the purchase. There’s simply no two ways about it. It might also surprise you that the Fire TV was the very first media streaming device to accommodate 4K and the quality is unmatched. Although we have already talked about Alexa’s prowess with the Amazon Fire TV Stick, there seems to never be an end to it, now with its integration with the 4K HDR support. And when both the top-notch features are made available to you at such a reasonable price tag, you cannot possibly have another option lingering in your minds. 4K, another word for Ultra HD, defines a resolution of 3840 x 2160 pixels. This is four times the resolution of a full HD TV, which stands at 1920 x 1080 pixels; hence, the name 4K. This directly translates to approximately 8.3 million pixels, which makes for a clearer and better-defined picture, courtesy of the higher amount of pixel density. To experience Amazon’s 4K quality, the most basic requirement is a 4K TV, which can help you get the most out of the device. 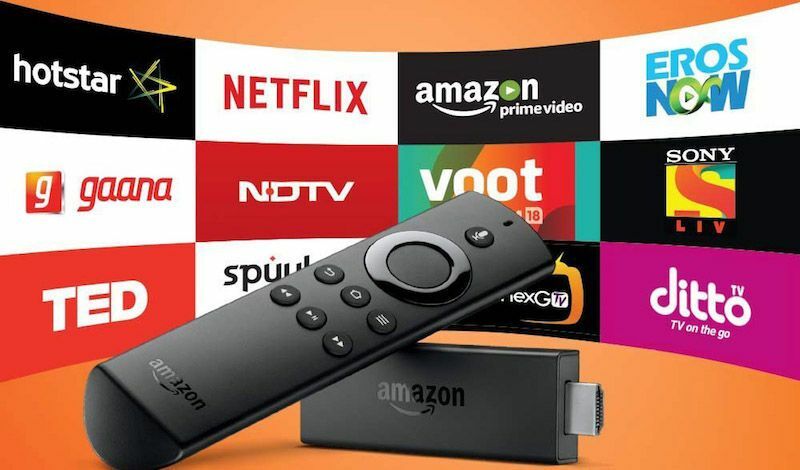 Viewing your favorite channels – Amazon Prime Videos, Netflix and YouTube with the Fire TV, is a sight to behold and something which at this price is not achievable anywhere else. Coming to HDR now, it is High Dynamic Range and refers to wider color palettes, higher brightness levels, and better contrast. In short, enhancing the overall quality of your picture to bring it as close as possible to reality. It allows for more natural true-to-life colors. On our way back to the Fire TV now, the newest 3rd generation is definitely a lot sleeker and faster and along with the added support of Alexa and 4K, leads the line when it comes to the best streaming devices, currently available in the market. The design is somewhat similar to Google’s Chromecast, in a way that both the devices have a tiny HDMI cable, attached to them. But apart from that, there are huge noticeable differences between the two. The remote comes with just the right number of keys and a navigation pad, sufficient to fulfill all the purposes. With this, you can tell Alexa to play any Amazon Prime content, and she’ll resume the show from where you last left. You can also tell her to play the next episode or rewind or move forward to a certain time, and she’ll be right on it. In the Amazon Music, you can command Alexa to play an artist or an album, or even a Pandora station, and you already know what she can do. Basically, the Alexa functionalities are largely similar in both the devices. It’s just really the case of 4K or not. One issue with the device is that although it offers a lot of TV shows from both Amazon Video and Netflix, the two biggest avenues for 4K HDR movies – iTunes and Vudu, have not been entertained by Amazon. The two have a seriously large library of movies, but the Fire TV’s incapability to access them kills some of the joy. Even though along with Amazon and Netflix, the 4K content will be offered by YouTube as well, none of them can match what Vudu or iTunes can give you. After the two Amazon offerings, we’ll have a look at what Nvidia can offer us with its Shield TV Pro home Media Server. 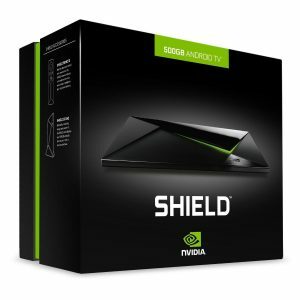 Nvidia released the very first Shield in the May of 2015 and is today available in two versions – the 16 GB flash storage one and the 500 GB hard drive one, which goes by the name Pro Shield. We’ll talk about the latter in this article. The 2015 version of the original Nvidia Shield TV was although categorized as a premium product, it never appeared to be taking the crown of the leading media streaming gadget from Roku or Amazon. The reason was that even after being 4K ready and powered by Android TV, the product was just too pricey for its initial set of offerings. And the additional $70 on top of it, that you’d have to shell out for the remote control, seemed too outrageous. In came the Shield TV Pro in January of 2017, with a wholly new version of the wireless remote and a game controller housing a mic for the Google Assistant voice control. Although Nvidia kept the price same, with the new set of features and a revamped interface, the company is confident to gain some ground, this time around. The device is currently available around $299. Let’s try to justify the product’s cost with its features. The Shield runs on Android 7.0 Nougat version and allows you access to GameStream, from a PC installed with a capable Nvidia GeForce Graphics Card, in up to 4K HDR. The Shield TV can be entirely controlled by the Google Assistant while Samsung SmartThings support gives way to the controlling of all the smart devices in and around the house. While the device has been made smaller this time and carries its customary enticing “game-like” looks, with the illuminating green LEDs and angled exterior panels, the controller, on the other hand, has seen some high-profile changes. Nvidia has replaced the Bluetooth with Wi-Fi Direct, which will now offer a low-latency connection and improve your battery life. One very attractive feature is that at the center of the gamepad, a button on the silver panel holds the Nvidia logo. Pressing this logo will activate the Shield’s voice search and other voice control features which can then be brought into functionality, courtesy of the pinhole microphone, present just above the button. Talking about the physical changes, the new controller has been tested to fit more comfortably in the hands. The seemingly alluring polygonal casing all over the controller has been taken as another likable feature of the product. The controller doubles as a wide-field microphone, which will come very handy, as and when a future update pushes for the full integration of the Google Assistant. This will have the power to compete with Amazon Fire TV in regards to the on-screen, visual results. The controller also felt lighter in comparison to the previous version. Coming to the accompanying remote now, Nvidia has attached a microphone to both the controller and the remote – the reason to which is unknown. The voice search works well to find content across various avenues. And although the current 5.6-inch remote is slightly larger than the old one, the design is pretty much the same. Probably the most eye-catching change here is the company’s replacement of the rechargeable battery with the cell battery. This means that what previously used to run for a period of 2 weeks to max a month, on a single charge, will now run off in approximately a year. And the new battery will not cost you a fortune. The remote also houses an IR transmitter, which can be used to switch On/Off the TV or change the volume (can be controlled by the game controller as well). Moving onto the Shield TV box now, it sports a 2.0 HDMI port which is important for Ultra HD content and you can also configure the HDMI CEC (Consumer Electronics Control) for your other devices to communicate to each other and work together. The device features two USB 3.0 ports at the rear end and is capable of handling Dolby Atmos and DTS-X audio streams. Finally, the gaming segment of the device has been basically spun around three choices: local games via GameStream, streaming games with GeForce Now and Android games through Shield TV’s own Tegra X1. Playing streaming games over the internet has also been made possible, due to Nvidia’s own servers with GeForce Now, with its offering of 100+ games. A $7.99 monthly subscription with the company’s cloud gaming service will give you more selections in the said regard. The last product on our list is the Raspberry Pi 3 Model B Motherboard, which at just $35, is the other extremely economical product on the list. A programmable device, it allows you to build possibly the cheapest Kodi box, that too on your own. Now, we’d like to tell you that if you’re looking for the 4K video streaming and/or high-end gaming, you need to stop right here, as the device can offer you neither of the two. But if you’re looking for an economical and portable solution to run Kodi on, read along; who knows, it might turn out to be your pick from here. 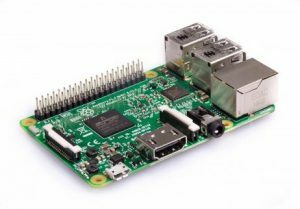 Since the launch of the first generation Raspberry Pi 1 model B, back in February 2012, the product has gone through at least 5-6 iterations, and what you see now is the latest version [except the smaller sized and reduced general purpose input/output capabilities Raspberry Pi Zero devices] of the current line-up. Although the primary intention behind the development of these small single board computers by the Raspberry Pi foundation was to promote the basic computer science teaching in schools and developing countries (the reason behind the low pricing), the newer developments and continuous upgradations have now paved the way for a more wider range of usage. The latest installment despite retaining the foundation’s flagship board, houses a lot of other improvements over its predecessor, one of which is not the Ram upgrade, kept the same at 1 GB. One noticeable modification can be seen in the form of the device’s speed which has gone up from the 900 MHz, in the previous model, to 1.2 GHz in the current Pi 3 model. The reason behind this is the integration of Quad Core Broadcom 64-bit ARMv8 processor in the device. But that’s not the most eye-catching improvement. In what can be considered as revolutionary additions, the device now comes with a built-in Wi-Fi chip, which makes it fully Wi-Fi ready. A Bluetooth LE (Low Energy), which gives more connectivity options. And the enhancement of power source from a max of 2 Amps to a max of 2.5 Amps now, facilitating the powering of more energy demanding devices via the USB ports. And did we tell you that the presence of the Quad-core processor will let you stream 1080p videos? Apart from the internet connectivity, the device also has full-sized USB ports and HDMI output. This means that a microSD card, display cables, and necessary power are all you need to get up and running. It’s true that the Raspberry Pi 3 is not the most revolutionary piece of hardware and not even the most technologically capable device, but for someone looking to bank upon an economical and cheap product to make it into his/her own customizable Kodi box, this could be the best solution. And as already said, if you’re happy with watching videos in 1080p and are not too big of a gamer, the Raspberry Pi 3 could be just what you need. So here it is. Four of the best Kodi boxes which should be relied upon to work in 2019, just fine. Each of the products has been manually tested for all the pointers that we have discussed here, and only after careful consideration, have been included in the list. Sometimes it so happens that an article, even after listing out the best 3-4 products and giving in-depth information about the same, is not able to remove that cloud of confusion from the readers’ minds. Since they go through everything that’s seeming “The Best”, it becomes a tough job to narrow down the choice to one single product. The reason? Every product has been portrayed as good only, so on what basis should one eliminate a particular offering? Well, that’s the very reason, why we’ve tried to include everything from a neutral perspective. It’s important to chalk out both the pluses and minuses of anything, so as to remove that cloud of confusion, and better position people to take the final call and make the purchase. And for someone who can’t allocate a lot of time to go through the entire respective info, we included the pros and cons section. But that’s not all that you’re going to take away from here. We’ve also included an “Our Pick” section here to let you in on the product that has got our personal inclination. While going through the evaluation process, this one product stood out and excelled in most of the parameters, if not all. Apart from having a ton of features packed into one small device, what makes it truly unique is the cost it is available in. After what you’ve already read about the product so far, next, you’ll find some additional information on how it became our choice for the best Kodi box in 2019. For Amazon Prime users specifically, there’s simply cannot be a better device than the Fire Stick. Everything that is there on Prime can be directly accessed via the stick’s interface. Also, a limited amount of free music or an unlimited amount of Prime music ($7.99 monthly subscription) can also be accessed and played on the television and on any connected speakers. Then there is the ease of navigation of the device, which can be adjudged to the fact that Amazon uses a heavily modified version of Android here, similar to Android TV’s interface. What this means is that the screen will show large rows of icons of apps and other content, arranged in various categories – your recent picks, suggested shows, etc. One thing we’d like to let you know is that even though Alexa is always ON, it’s not always active. Your TV needs to be powered up for it to function. So, is it a painful task to talk to Alexa with the Fire Stick? Of course not. Once your TV has been powered up, you need to tap the mic button and speak into the remote. After this, the stick starts behaving just like any another Alexa device and does all the mundane and not-so-mundane tasks for you. (Unfortunately, you cannot use the hands-free version of Alexa, that comes with Amazon Echo products). By holding the microphone button and speaking to Alexa, you can search for movies, shows, apps, etc., and the Fire Stick will give you visual information on your TV in response to your Alexa requests. When it comes to pricing as well, although the Raspberry Pi 3 can make for a good enough Kodi box, the fact that the Fire TV Stick is available at the same price, the latter, in all probability and with its uncountable inciting features, will be the better choice.